Where do you get your inspiration and where do you buy your supplies? Art Van Go - Art Van Go, now incorporates Vycombe Arts - A static shop plus a travelling van of art and textile art supplies and on line sales. Also exhibitions and workshops at their gallery in Knebworth. Braintree District Museum - This museum at Manor Street, Braintree, Essex, UK, CM7 3HW is our spiritual home. It is open Tuesdays to Saturdays from 10am to 4pm and as well as an interesting history of Braintree, including several textile based industries, there is a running programme of special events and exhibitions. Warner Textile Archive - This archive, also in Braintree, Essex is found at Silks Way, Braintree, CM7 3GB and is open every Wednesday and the first Saturday of each month from 10am to 4pm. Researchers can contact the archive for access on other days. Our EAST @ The Warner Textile Archive was inspired by a visit to this archive. They also run special events and exhibitions and have a regular monthly newsletter. In May each year they run a successful Textile Fair. Foundling Museum - one of our members (Janette) now works part time for this museum, which has also been the inspiration for much of her work. The museum has a rolling programme of both historical and contemporary art exhibitions, talks, workshops, etc. Landmark Arts Centre - an arts centre in Teddington, London TW11 9NN - exhibitions, workshops, events and an annual textile fair (plus other craft and food fairs). E.A.S.T were invited to exhibit here in 2016. Zinc Arts at Chipping Ongar, Essex - an arts centre that can be hired. EAST used this venue for a workshop with Diane Bates in 2016 - good accommodation (en suite), good food and lovely staff. Also excellent parking facilities. The cafe is open for the public and they also run their own workshops throughout the year. 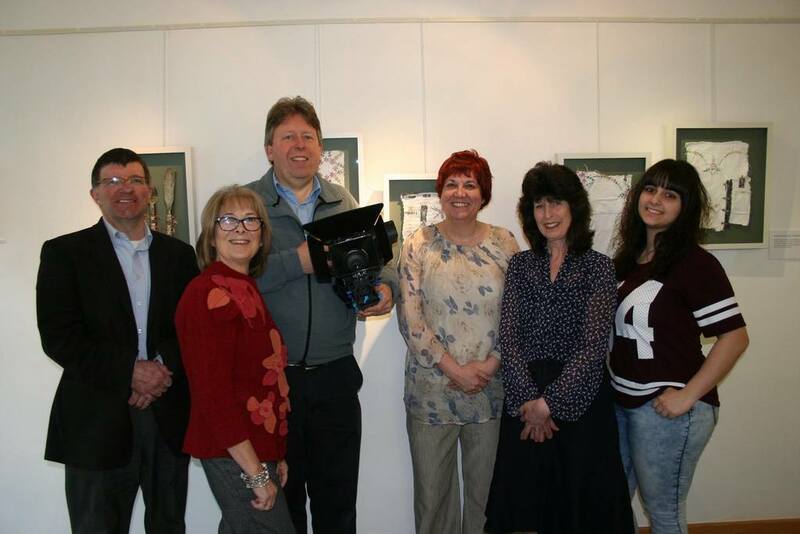 Just Hands-On TV - E.A.S.T members, Janette and Susan, were interviewed in March 2015 by this internet TV company that specialises in textile related programmes and workshops. A link will be available shortly with details as to how this interview can be viewed. D-2-D Courier Service - a "man with a van", based in Chelmsford in Essex who very efficiently delivered our work from Braintree to Teddington. For more information email datmack1@gmail.com or telephone 07880 317456/01245 442696. Eastern Regional Textile Forum - a networking group based in the eastern region of the UK bringing together textile artists of different disciplines. This group runs two conferences a year and regular exhibitions. Open to all. Embroiderer's Guild - the international voice for embroiderer's. There are branches across the UK. The Eastern Region has it's own blog site. Silk Painters Guild - for information on silk painting. Open to all. The Knitting and Stitching Shows are run every year in London (spring and autumn), Edinburgh, Dublin and Harrogate, Yorkshire. EAST have been regular exhibitors over many years. Their last exhibition there was Between the Lines at the London and Harrogate exhibitions in autumn/winter 2014. The Victoria and Albert Museum and the Fashion and Textile Museum are both in London and have regular textile exhibitions as well as events, workshops, talks, etc. Ramster in Surrey have regular (biannual) textile exhibitions and is set in beautiful gardens. The Textiles East event is a new event in Cambridgeshire with retail opportunities, workshops and talks. There are many magazines on the market that specifically relate to textiles but the ones we find most inspiring are, Be Creative with Workbox, Embroidery and Stitch. Workshop on the Web is an on line resource of workshops run by Maggie Grey. Other galleries and art trails are other places where textile (and other) art can be seen and these are just a few local to us - Menier Gallery, Essex art trails(various locations and throughout the summer), Cambridge Open Studios. Open House Art (various locations) is a countrywide listing and Stroud International Textiles is a large event that includes open studios, talks and workshops. EAST were very pleased to be invited to participate in Select 2013. Textile Artist is a website set up to be a place of inspiration and resources for textile artists - in particular information on how to promote your work, setting up a website and blog, etc, etc. This textile artists link has regular updates about artists, ideas, exhibitions and anything really related textile artists.